Lawrys Salt Free 17 Seasoning is the perfect seasoning for today's health-conscious cook. Lawrys Salt Free Seasoning makes reducing your sodium intake a pleasure. That's because Lawry's swapped the salt for 17 tempting herbs and spices, which give meals more flavor than ever and without lifting a salt shaker. 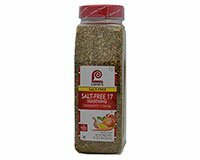 Salt Free 17 Seasoning is a natural blend of 17 ingredients that enhances seafood, poultry, pasta, vegetables and more. Just a few shakes delivers colorful, salt free flavor excitement! Ingredients: Spices (Black Pepper, Basil, Oregano, Celery Seed, Dill Weed, Sage, Bay Leaves and Turmeric), Garlic, Onion, Carrots, Citric Acid, Sesame Seeds, Red Bell Peppers, Orange Peel, Parsley Flakes, Cornstarch and Lemon Peel.